Before you enroll, find out what kind of salary you can earn with a bachelor’s degree from these Idaho colleges with the highest-paid graduates. Of the 11 four-year colleges in Idaho, some of the most well-known are University of Idaho, Boise State University, Idaho State University (ISU) and the College of Idaho. Almost every known gem has been found in the Gem State, but the top job types are mostly in healthcare. The University of Idaho is a college with some of the highest-paid graduates, both at five years after graduation and at 10 years after graduation. The University of Idaho Vandals have enough school spirit, and earning potential, to make up for their relatively small population. Graduate degrees don’t have a huge impact on how much Idaho college graduates get paid. 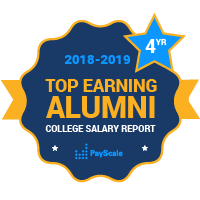 All the Idaho schools on this list only see a slight increase when PayScale includes salary data for alumni who go on to earn graduate degrees. Northwest Nazarene University is a small private Christian university in Nampa, Idaho. It may not have the highest paid graduates in Idaho, but it does have a high percentage of students who think their jobs make the world a better place. The school produces a lot of students who go into religious work or social service.